CINCINNATI (AP) — Freddy Peralta threw the ball past the free-swinging Reds or got them to hit it into the air harmlessly. The 22-year-old right-hander had a career day and provided the Brewers with yet another close-as-it-gets win. 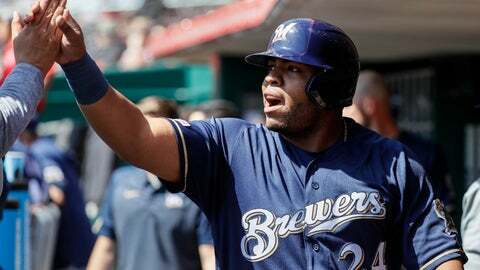 Peralta allowed a pair of singles over a career-high eight innings, and Manny Pina singled home a run with Milwaukee’s only hit off Luis Castillo on Wednesday, leading the Brewers to a 1-0 victory and a three-game sweep. The defending NL Central champions improved 6-1, two games better than the start last year, when they tied the club record with 96 victories. Five of the wins have been by one run, with their pitching making the most of an offense yet to hit its stride. This time, the Brewers managed only two hits and won anyway. “We’re in a really good moment, we’ve just got to keep it going,” said Jesus Aguilar, who scored the only run. Peralta (1-0) lasted only three innings on Friday during the Brewers’ loss to the Cardinals, but he dominated the Reds . Eugenio Suarez singled in the second inning, and Peralta retired his next 20 batters before Curt Casali singled in the eighth. Peralta allowed only two runners, fanned 11 and threw 100 pitches, retiring the Reds exclusively on strikeouts or balls hit in the air — not one groundout. Alex Wilson gave up a walk and a single in the ninth while getting his first save. “You could feel both pitchers going at it,” Peralta said through a translator. Pina’s RBI single in the second was Milwaukee’s only hit off Castillo (0-1), who walked four and struck out nine in seven innings. A weird balk set up the run. Aguilar reached on a one-out walk. The Reds decided to have Joey Votto play off the base because Aguilar isn’t a threat to steal. Castillo knew Votto was playing back, but he made a pickoff move anyway and froze, causing a balk. Pina followed with his first hit of the season for the Brewers’ fourth straight one-run win. They usually do against the Reds. Milwaukee has won 16 of 22 against the Reds in the last two seasons, including six shutouts. The Brewers’ five shutouts in the series last year marked the most by a team against the Reds in a season since the Pirates’ five in 1960s. Cincinnati completed its opening homestand at 1-4, matching its start last season. The Reds’ starting pitching has been better, improved by three offseason trades, but their offense has struggled. The Reds are last in the NL with 11 runs and a .167 team batting average. Starting outfielders Winker, Matt Kemp and Scott Schebler fell to a combined 1 for 42 this season. The Reds were shut out twice during the opening homestand. They were blanked only three times all season at GABP. It was the Reds’ first 1-0 loss at home since Aug. 26, 2017, when Gerrit Cole homered for the Pirates. The Reds’ only out off a ground ball was the final one, a forceout at second base. Aguilar, the Brewers’ first baseman, had no putouts in the game. Brewers: RHP Jeremy Jeffress will pitch at Triple-A on Friday. He’s on an injury rehabilitation assignment from a sore shoulder and could rejoin the team soon. Reds: Suarez reached for his back after a hard swing-and-miss in the fourth inning, but he stayed in the game. Brewers: After a day off, Milwaukee opens a three-game series against the Cubs at Miller Park with Brandon Woodruff (1-0) making his second start. The Brewers have won eight of the last 11 games between them, including the NL Central tiebreaker. Reds: Tyler Mahle makes his 2019 debut as the Reds open a four-game series in Pittsburgh. The teams split a rain-shortened two-game series to open the season.